It is said by many that "you can never go home again". It is the kind of thing that people say when have been away from the old home town for many years, and find themselves much changed during their absence. For many people, leaving their old home town is a birth experience… one that can never be repeated… and no matter what, we all know that we can't return to the womb. I returned to the New Jersey town where I experienced my brief childhood last Wednsday morning, only to have to immediately meet my brother and sister to go to the hospital and see my mother. On the way down I-78 (west) we passed some of the signposts of my life: The intersection of Liberty road and Vauxhall road, where we would turn right to get to Battle Hill elementary school. Chet Schmidt's house, right across the street. We drove past what was once a country club, and is now the home of a Target, Best Buy, and Whole Foods Market (my little working class town has a Whole Foods? Shut Up! ), We drove past the Super Home Depot which used to be a department store called Great Eastern. In three minutes, we were through my old hometown and very shortly we left the highway and drove up Broadstreet, in Summit, past Wallace Chapel A.M.E. church, where I was baptized, and was an active member of the youth choir. In practically no time, we were at the hospital. Overlook hospital has played a fairly large role in my life. I wasn't born there, but from my early youth, it was a place where members of my family went when they were seriously hurt or ill. My brother had to be treated there when he got hurt playing soccer in high school. He also had his appendix removed there when he was around 14. My grandmother had a kidney stone removed there when I was ten… she was also treated there when she had her stroke(s). My mother has been treated there for many things, many times. Now she is there in the oncology wing… I'm not sure if she is going to get to go home. My sister had called me the day before, to tell me that mom had taken a bad turn at home, and had to be rushed to the hospital. Apparently, her radiation treatments and chemo-therapy combined, had so greatly damaged her throat that she hadn't been eating or drinking. Mom had lost nearly sixty pounds since November… and was severely dehydrated. It was time for me to come home. Home. When I think of home, I no longer think about Vauxhall, New Jersey. When I think of home, I think of the place I am now, as I type this: In my house with my wife and youngest daughter, but I knew what my sister meant when she told me I needed to come. I sat at my desk, slightly stunned, even though the rational, logical part of me had been preparing for this day for seven or eight years, since my mother was diagnosed with cancer the first time (it was lung cancer then). I knew that mom wasn't going to live forever, every bit as much as I know that my 90 year old grandmother won't live forever. The thing is, my mother spent her life abusing nicotine, cocaine and no small number of other harmful substances, and now, in a way, these things have come home to roost. I told Mrs. GF, and then I told my boss, who told me to take off and comeback whenever… he lost his father unexpectedly last year, and wanted me to get home "in time"…, but I stayed at work for a few more hours. I don't know why. Maybe I thought that leaving would hasten the inevitable. Maybe I just didn't want to be there for some sort of gurgling death scene. Anyway, I went home in the early afternoon, and got myself together for my trip. Vauxhall, New Jersey isn't very far from Woodbridge, Virginia. If you don't hit and major traffic around Washington, DC or Baltimore, Md., you are in for a ride of about three and a half hours. Mine was a fairly short trip that had little excitement other than my not having any cash in my pocket for the Fort McHenry tunnel toll when I was passing through Baltimore. Fortunately, the toll takers are set up for this eventuality, and issued me a "violation" along with instructions on how to pay the toll by telephone. In practically no time, I was crossing the Delaware Memorial bridge into New Jersey (have I ever mentioned my fear of high suspension bridges? ), and driving on to the Jersey Turnpike. I'll tell you one thing, I hate that road. I have always hated it, and I suspect that I always will. I drove north until exit 11, where I entered the Garden State Parkway, where I continued until I got to a rest stop at the exit for my hometown… this is where I met my siblings. I was trying to keep it together as we entered the hospital, because coming unglued because seeing would be just about the last thing my mother needed to see, especially since I hadn't seen her in about 4 years. So, I did what people often do at times like this: I put a smile on my face, walked into my mother's room, and said "Hi mom!" To say that my mother was surprised was an understatement. Because of the condition of her throat, she couldn't say much above a hoarse whisper, but she was glad to see me, her tears said so. To tell you the truth, despite my smile, I was horrified. I didn't recognize the person lying in that bed. It took me a few minutes to find my mother in that face. My mother was happy. My mother is deathly ill. My mother was… well… my mother. Despite being sick, she was still the mercurial, biting, mental, mean-spirited person that I knew as a child. I didn't stay long, but I stayed long enough to let her know that I was there because I cared. To tell you the truth, I only stayed because it was going to please my grandmother. My sister left first, because it was Ash Wednesday, and she had to lead the evening service at her church (I think that I have mentioned before that she is a minister, right? ), my brother and I stayed for a little while before starvation drove us to seek food at the world's greatest pizzeria: Joe's Drive In Pizzeria, 2062 Springfield Avenue, Vauxhall, New Jersey. On our way to Joe's, my brother and I drove around our old hometown to look at the places of our youth. For my brother, none of this was new, as he returns several times a year to dance attendance on my mother who hates him (silly boy). I looked at the place in wonder, since it had been nearly eleven years since I was there (repeat visits to unhappy places are counter-productive, in my view). We drove past all of my schools; the old library which was my shelter and refuge when I was a kid; the homes of my old friends; and the house I grew up in. I was treated by fate or by design, to a joyful reunion with one of my best friends from childhood, Oliver, who lived down the street, was working on his car in the driveway as we passed. He still lives in the house he had shared with his parents and little brother when we were kids. We talked and talked, and told stories about when we used to blow up toy soldiers with firecrackers and M80s. We eventually made it to Joe's and had our lunch before continuing our ride around town, and while we ate, we talked about things. Things always known about our childhood, but never discussed… never talked about. Things best left under rocks, for the most part. Anyway, we demolished unpleasant subjects as quickly as we demolished that Joe's Special, and headed back out. We drove around some more, past the Union Boy's Club, Union Center, the old, now closed for many years China-Sky restaurant. We laughed together like brothers should… even though we never really did. It was getting dark, and it was time to end the reminiscing so we could drive to my sister's house (we were both staying there). On the way, we decided to go get some beer, and we went to the MOST AWESOME LIQUOR STORE that I have ever seen. That place had EVERYthing… so we got some really great beer, and some wine for my sister, and headed to her place where all of us (after Teresa came home from church), had some beers and wine and a long talk (which was mostly laughter) late into the night it was nearly two A.M. when I went to bed. I visited the hospital again on Wednesday morning. Apparently, my mother was now out of crisis. She even mentioned going home on Monday. I didn't stay as long as I had before… I just couldn't. I decided that what I wanted to do the most was to go home. Home. So that is where I went. I drove through my hometown, towards the interstate, filtering through boyhood memories. I laughed aloud a few times, smiled a lot, and looked for familiar faces. I drove past the store (well, it's a bank now) where I got my first Cub Scout Uniform. I was at the on-ramp of the Parkway by now, and ready to start my drive. It was late, there was going to be a lot of traffic, but my bottle was full. That town doesn't fit me now… no more than that old Cub Scout uniform would. I think that it is best left as a memory, the shadow of things past, of things half-remembered, but mostly best forgotten. I suppose for some people, you can go home again… but I can't, at least, not in the sense that most people mean. I don't think that I'll be going back to Vauxhall any time soon, if ever (unless I sneak into town for a Joe's Special). I was going home. Not to the place where I was from… but to the place where I am always happy to return to. I had planned to start this series a few weeks ago, but life had other plans. So here we are. This series of posts will be about places that have either meant a lot to me, or I have at least found interesting enough to tell a story about during my now-twenty one years in the Washington, DC area. 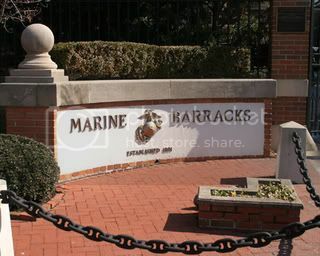 I have been here since May of 1986, when I was assigned to the Marine Barracks located at 8th & I streets, Southeast, in Washington, DC. The Day I arrived in DC was an important one, as it has shaped the rest of my life. After being assigned to DC and learning to love the place, I put down roots here and decided to stay here after my second enlistment was up (I had plan to make a career of the Marine Corps, but coming to DC spoiled me). After the end of my first marriage, I lived in a few different places until I ended up here, on A street, southeast. I lived in a rather small apartment in this building, but my memories of this time are very happy, on the whole. While I lived here... I call it my time in the wilderness, I learned a little more about the grown-up me... I also learned to find joy in a spartan environment (no lie, my kitchen was smaller than the closet in our current walk-in closet. 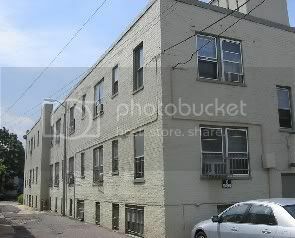 Seen from the rear of the building, in this picture, my apartment was on the top floor on the corner. 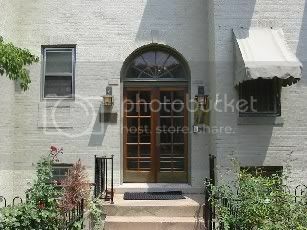 Yeah... pretty small, but since the building was under rent-control, I was only paying $600 a month! It was in a great neighborhood, that had an incredible amount of police protection (there were lots of members of Congress in the neighborhood). You know what one of the other great things was about that apartment? It had really, really hot water, and incredible water pressure! Now, as a suburbanite who lives in an area where homes are being built, I have become used to less than thrilling water pressure, but after showering in my old apartment, your skin would actually tingle! The other great thing about is something that I already mentioned. The neighborhood. 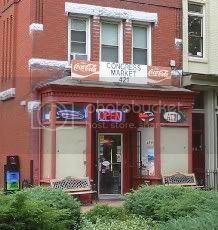 The neighborhood was only 4 blocks from the main Library of Congress building, 5 blocks from the great Capitol Hill pubs that I used to haunt, like the Hawk n Dove, or Tunnicliff's Tavern and just 2 blocks from venerable, old Eastern Market. Although I lived in this neighborhood during what could have been a real low point in my life, sorting through the train-wreck of my post-divorce life, I wasn't miserable. While living there my love for Washington, DC deepened. My love for urban living blossomed. I started to grow. My apartment was a short walk from the Eastern Market Metro (subway) station, which I rode to and from work (and the gym, which was my main entertainment, since I was pretty much broke... but in great shape). Eventually, things started to turn for me. I was promoted twice, and having a little more money allowed me to I start taking a bit more joy from my surroundings. Fastpitch and I would make day trips every other weekend, to the National Zoo, or the ride the carousel on the National Mall, or ride the metro out to Pentagon City mall. The best thing that happened to me during this period, though, was that I met and successfully wooed, the person who would become Mrs Gunfighter. I left that neighborhood when we got married, in 1994, and headed for the Virginia suburbs. In the intervening years, I went to work for a different agency and work in the Virginia 'burbs, I still have to go into the city from time to time, and when I do, I always drive through the old neighborhood.